IN THIS NEXT installment of my Culture of Critique series, we will be examining the intellectual and political movement of neoconservatism. Sobran wrote that in National Review back in 1992 in a piece titled In Pursuit of Anti-Semitism. Shortly afterwards in 1993, Joseph Sobran was fired from National Review. Sobran was frequently accused of anti-Semitism and eventually his anti-Israel rhetoric got him purged from Conservatism, Inc.
Fast-forward a decade to the beginning of the Iraq War and the height of neoconservatism. To be against the Iraq War meant you were unpatriotic and probably a traitor. The war drums were banging and every single despot in the Middle East had a target on his back. “Weapons of mass destruction (WMDs)” and “pre-emptive strikes” became common in the American political lexicon. The Iraq War motivated me to become politically active. I was kind of confused because I was a relatively conservative guy but was against the Iraq War. It wasn’t until several years later that a certain statesman named Dr. Ron Paul cured my apathy and shined light on the political ideology known as neoconservatism. It was then that I became aware of the overtly Jewish influence in neoconservatism and I began to see why our foreign policy was conducted in a manner that Samuel Francis described as “slavishly pro-Israel.” Let us examine neoconservatism, one of the most recent and influential Jewish intellectual movements of our time. Compared with their deep and emotionally intense commitment to Israel, neoconservative attitudes on domestic policy seem more or less an afterthought. In general, neoconservatives advocate maintaining the social welfare, immigration, and civil rights policies typical of liberalism (and the wider Jewish community). Even though most neoconservative policies do not differ from the opinions of the wider Jewish community, most Jews are not neoconservatives. That being said, most neoconservatives are Jews. That is what we will be examining in this post: the extent to which Jews dominate the movement. It is also important to note that the Jews involved have a strong sense of Jewish identity and that their actions are aimed at achieving specifically Jewish goals. An important feature of Jewish intellectual and political movements has been their association with prestigious universities and media sources. The university most closely associated with the current crop of neoconservatives is the University of Chicago, which was home to Leo Strauss as well as Albert Wohlstetter, mathematician turned foreign policy strategist and mentor to Richard Perle and Paul Wolfowtiz, both of whom had substantial influence in the George W. Bush administration. Another important academic home for the neocons has been the School of Advanced International Studies (SAIS) at Johns Hopkins University. Paul Wolfowitz spent most of the Clinton years as a professor at SAIS. Also, Eliot Cohen is the Director of SAIS. Cohen has been a signatory member to a number of the Project for a New American Century’s (PNAC) statements and letters. He served as an adviser to the Center for Security Policy, a neocon think tank. He served as Counselor to the United States Department of State under Secretary Condoleezza Rice from 2007 to 2009. Neoconservatives, as with many Jewish intellectual and political movements, had access to prestigious mainstream media outlets. Most notable are the Wall Street Journal, Commentary, The Public Interest, Basic Books (book publishing) and the media empires of Conrad Black and Rupert Murdoch. Murdoch owns the Fox News Channel, the New York Post, and is the main source of funding behind Bill Kristol‘s Weekly Standard. Important thing to note is that neither Black nor Murdoch are Jewish, but they are neoconservatives. As with all of these intellectual and political movements, Jewish thinkers comprise the core of the movement but Gentiles are nearly always present in the movement as well. To further illustrate these connections, let us look at Richard Perle. Perle is listed as a Resident Fellow of the American Enterprise Institute (AEI) and he is on the board of directors of the Jerusalem Post and the Hollinger Corporation, a media corporation that was controlled by Conrad Black. Hollinger owns many major media properties around the world, like the Chicago Sun-Times (US), the Daily Telegraph (UK), Jerusalem Post (Israel), and the National Post (Canada). Hollinger owns dozens more of smaller media outlets in the US, UK, and Canada. All of these media outlets reflect a vigorously pro-Israel stance held by Perle. Neoconservatives like Jonah Goldberg and David Frum also have a very large influence on National Review. 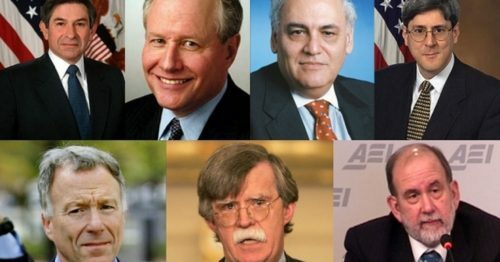 Neocon think tanks such as the American Enterprise Institute (AEI) have a great deal of cross-membership with Jewish activist organizations such as AIPAC, JINSA, and WINEP. A major goal of AEI is to maintain a high profile as pundits in the mainstream media. A short list of AEI members who appear in various media outlets as pundits would include Michael Ledeen, Charles Krauthammer, Michael Rubin, Reuel Marc Gerecht, and David Wurmser. Prior to providing intelligence disinformation in the leadup to the Iraq War, Wurmser held a Middle East Studies Program position at AEI. This position at AEI was funded by Irving Moskowitz, a wealthy supporter of the settler movement in Israel and neocon activism in the US. So while most American Jews are not neoconservatives, the wider Jewish community did their part to serve and support the neoconservative agenda by supporting the war in Iraq and silencing all those who were guilty of the crime of noticing the Jewish agenda. All twentieth-century Jewish intellectual and political movements stem from the deep involvement of Jews with the Left. However, beginning in the late 1920s, when the followers of Leon Trotsky broke off from the mainstream Communist movement, the Jewish Left has not been unified. By all accounts the major figure linking Trotsky and the neoconservative movement is Max Shachtman, a Jew born in Poland in 1904 but brought to the US as an infant. Like other leftists during the 1920s, Shachtman was enthusiastic about the Soviet Union, writing in 1923 that it was “a brilliant red light in the darkness of capitalist gloom.” Shachtman began as a follower of James P. Cannon, who became converted to Trotsky’s view that the Soviet Union should actively foment revolution. Trotskyists took seriously the Marxist idea that the proletarian socialist revolution should occur first in the economically advanced societies of the West rather than in backward Russia or China. They also thought that a revolution only in Russia was doomed to failure because the success of socialism in Russia depended inevitably on the world economy. The conclusion of this line of logic was that Marxists should advocate a permanent revolution that would sweep away capitalism completely rather than concentrate on building socialism in the Soviet Union. Shachtman broke with Trotsky over defense of the Soviet Union in WWII, setting out to develop his own brand of “third camp Marxism” that followed James Burnham (who went on to write for National Review) in stressing internal democracy and analyzing the USSR as “bureaucratic collectivism.” Shachtman defended an open, democratic version of Marxism but was concerned that his critics were abandoning socialism. Shachtman himself became a Cold Warrior and social democrat in the late 1940s. He saw the Stalinist takeover of Eastern Europe as a greater threat than US power. By the 1950s, he rejected revolutionary socialism and stopped calling himself a Trotskyist. During the 1960s, he saw the Democratic Party as the path to social democracy, while nevertheless retaining some commitment to Marxism and socialism. In the 1960s, “he suggested more openly than ever before that US power could be used to promote democracy in the third world” — a view that aligns him with later neoconservatives. The main link between Shachtman and the political mainstream was the influence he and his followers had on the AFL-CIO. In 1972, shortly before his death, Shachtman, “as an open anti-Communist and supporter of both the Vietnam War and Zionism,” backed Senator Henry Jackson in the Democratic presidential primary. Jackson was a strong supporter of Israel and by this time support for Israel had become a litmus test for Shachtmanites. Interesting to note is that Douglas Feith, Abram Shulsky, Richard Perle and Paul Wolfowitz served as aides to Senator Jackson. Each of them also went on to serve in the George W. Bush administration. A new wrinkle, in comparison to earlier Jewish intellectual and political movements discussed in Culture of Critique, has been that the central figures, Norman Podhoretz and Irving Kristol, have operated not as much as intellectual gurus but more as promoters and publicists of views which they saw as advancing Jewish interests. Podhoretz’s Commentary (published by the American Jewish Committee) and Kristol’s The Public Interest became clearinghouses for neoconservative thought, but many of the articles were written by people with strong academic credentials. In the area of foreign policy, a primary concern of Jewish neoconservatives from the 1960s-1980s was the safety and prosperity of Israel, at a time when the Soviet Union was seen as hostile to Jews within its borders and was making alliances with Arab regimes against Israel. During the 1960s, a schism began to arise on the Left. Despite being strong supporters of civil rights for Blacks, many Jews opposed black efforts at community control of schools in New York because they threatened Jewish hegemony in the education system. Also during this time, we begin to see the rise of Black anti-Semitism. The New Left also tended to have negative attitudes toward Israel, with the result of many Jewish radicals eventually abandoning the left… “mugged by reality” if you will. Many on the New Left described Zionism as “racist colonialism” which massacred and oppressed Arabs. In 1970, Podhoretz began to wield his Commentary magazine as a weapon against the New Left. In 1972, Kristol supported Nixon and became a Republican about ten years before most neocons made the switch. The neoconservative takeover of the Republican party and of American conservatism would have been entirely unnecessary had not the Democratic Party shifted to the left in the 1960s. Henry Jackson embodied the political attitudes and ambitions of a Jewish political network that saw Jewish interests as combining traditionally liberal social policies of the civil rights and Great Society era with a Cold War posture that was at once aggressively pro-Israel and anti-Communist at a time when the Soviet Union was perceived as the most powerful enemy of Israel. This “Cold War liberal” faction of the Democratic Party was dominant until 1972 and the nomination of George McGovern. After the defeat of McGovern, the neoconservatives founded the Committee for a Democratic Majority, whose attempt to resuscitate the Cold War coalition of the Democratic Party had a strong representation of Shachtmanite labor leaders as well as people like Podhoretz’s Commentary. 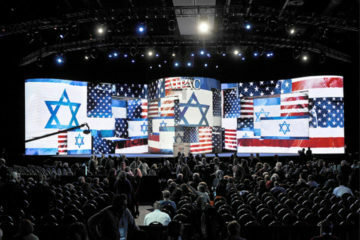 After failing again in 1976 and 1980 to gain the presidential nomination for a candidate who represented their views, this largely Jewish segment of political activists — now known as neoconservatives — switched allegiance to the Republican Party. The neocons had considerable influence in the Reagan years but less in the George H. W. Bush administration, only to become a critically important force in the foreign policy of George W. Bush administration where, in the absence of a threat from the Soviet Union, neoconservatives have attempted to use the power of the US to fundamentally alter the political landscape of the Middle East. The rapid rise and immense influence of neoconservatives make them a remarkable example of Jewish organization and influence. Individuals with strong Jewish identities maintain close ties to Israeli politicians and military figures and to Jewish activist organizations and pro-Israeli lobbying groups (i.e. Daniel Pipes and his MEF) while occupying influential policy-making positions in the defense and foreign policy establishment. These same individuals, as well as a chorus of other prominent Jews, have routine access to the most prestigious media outlets in the US. People who criticize Israel, however, are routinely vilified and subjected to professional and personal abuse. Taken as a whole, neoconservatism is an excellent illustration of the key traits behind the success of Jewish activism: ethnocentrism, intelligence, wealth, psychological intensity, and aggressiveness. One can easily see how Jews, despite being a tiny minority of the US population, have been able to transform the country to serve their interests.
. . . and callous cold-blooded murder—when the victim is sent to the Middle-east in the uniform of his country. @Arvin, not only is it the cold-blooded murder of thousands of American soldiers, sent to fight and die for Israeli interests in the Middle-east, it is the cold-blooded murder of our entire race. Neoconservative, n. One who believes that democratic nations should start wars to spread democracy, because democratic nations don’t start wars. A Max Boot not on the ground. A great American patriot whose only regret is that you have but one life to give for Israel.